The No. 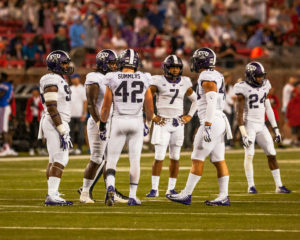 15 Horned Frogs are matched up with one of college football’s perennial powerhouses as the No. 4 Buckeyes present a daunting challenge on both sides of the ball. Last week Ohio State trounced Rutgers 52-3 as the Buckeyes recorded 579 yards while allowing just 134. 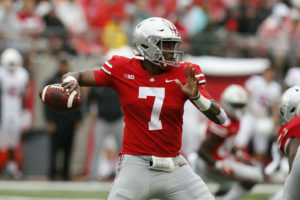 Buckeye quarterback, sophomore Dwayne Haskins already has Heisman buzz with two impressive performances. He has thrown for 546 yards and nine touchdowns on 42-53 passing. The Buckeyes rushing attack averages 300 yards per game, 12th in the nation. Junior running back Mike Weber has led the way with 247 yards and three touchdowns. 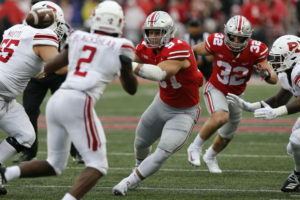 Overall, Ohio State boasts the second-best offense in the nation, averaging 650 yards per game and 64.5 points per game. Small said he anticipates the game will be won at the line of scrimmage and said the defensive front will have a huge impact on the outcome of the game. Headlined by defensive end Ben Banogu and defensive tackle Corey Bethley, TCU’s defense has allowed just 10 points this season while recording 12.5 tackles for loss. The defense has proven themselves against elite offenses in the past, as six of their 14 games last season were against top-20 offenses. Defensive end L.J. Collier will return to the lineup this weekend, but that does not confirm defensive end Ty Summers’ return to linebacker. TCU’s defense will be challenged by Ohio State’s dynamic offense. Photo by Cristian ArguetaSoto. On the other side of the ball, TCU’s young offensive line will be tested against the nation’s No. 17 defense, highlighted by junior defensive end Nick Bosa. Bose leads the team with nine tackles and five tackles for loss through the first two weeks. He has achieved one sack in five consecutive contests. Ohio State has two other linemen who have achieved multiple sacks so far, defensive tackle Dre’Mont Jones and defensive end Chase Young. “The defensive line is obviously good we know that, but at the same time we’re just playing football,” said center Kellton Hollins. While the Buckeyes will be TCU’s toughest challenge this season, Patterson sees no difference between them and the Wisconsin team they faced in the 2011 Rose Bowl. The Badgers were averaging 50 points per game heading into the Rose Bowl seven years ago. The Buckeyes and the Horned Frogs will hit the gridiron 7 p.m. Saturday evening on national television in Arlington, Texas. Having played in AT&T Stadium a season ago, the Horned Frogs are comfortable under the bright lights of Jerry World.